Das folgende Werk ''Thomas Jefferson'' ist eine Kurzbiografie zu dem 3. Präsident der Vereinigten Staaten, Thomas Jefferson. Die Biografie wurde von einem Schülern aus der 10 Klasse als Hausarbeitet vorbereitet. Es gibt Auskunft über sein Leben, die Verdienste, die er für die Unabhängigkeit erhält. Thomas Jefferson (1743-1826) war einer der Führer der Unabhängigkeitsbewegung gegen Großbritannien , den Verfasser der amerikanischen Unabhängigkeitserklärung und der dritte Präsident der Vereinigten Staaten von Amerika ( 1801-1809 ). Der Text geht weiter in der Tiefe mit diesem Thema. In 1774 Jefferson published the writing "A Summary View of the Rights of British America". It was his most important contribution. Therein he argued that the first settlers came as independent persons to America and not as envoys of the British government. They would have the right to determine their type of government by themselves. As a result the Continental Congress instructed Jefferson, a member of the Congress, to formulate of the Declaration of Independence of the 4th July 1776. 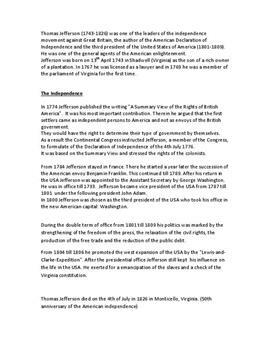 It was based on the Summary View and stressed the rights of the colonists. From 1784 Jefferson stayed in France. There he started a year later the succession of the American envoy Benjamin Franklin. This continued till 1789. After his return in the USA Jefferson was appointed to the Assistant Secretary by George Washington. He was in office till 1793. Jefferson became vice president of the USA from 1787 till 1801 under the following president John Adam. Analyse und Charakterisierung von Thomas aus "Buddenbrooks"